Eric Li, who teaches marketing in UBC Okanagan’s Faculty of Management, says the Starbucks red cup generated more attention than an expensive holiday marketing campaign probably might have done. If a picture is worth 1,000 words, then a viral video is priceless. On November 1, Starbucks released its 2015 holiday cups. It’s a marketing tradition that’s been around since 1997. This time, however, the traditional cups were controversial — uncharacteristically devoid of traditional North American Christmas symbolism. They were instead a blank red. Only four days after the release, former TV and radio evangelist Joshua Feuerstein took to Facebook to express his outrage that “Starbucks removed Christmas from their cups because they hate Jesus.” The video currently has more than 16 million views and almost 200,000 likes. Assistant Professor Eric Li, who teaches marketing in UBC Okanagan’s Faculty of Management, thinks that Starbucks should have Feuerstein on the payroll for all the attention he’s generating for the coffee chain. “Starbucks knows the consumer has a short memory. 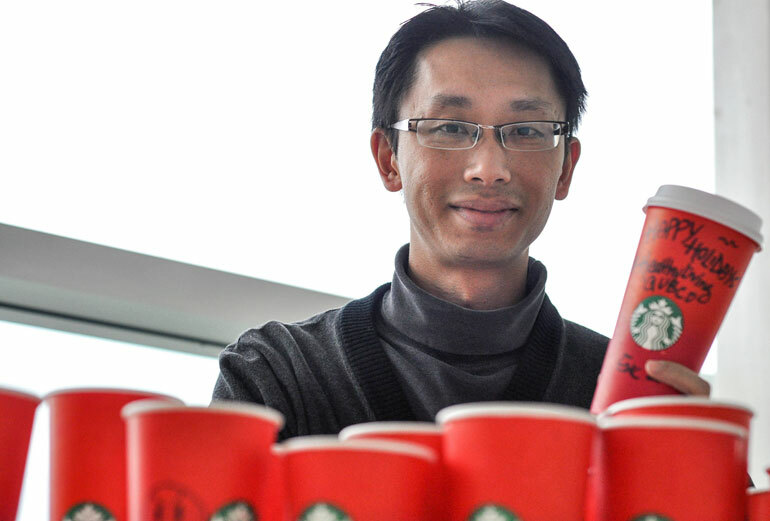 In the past, people would talk about the red cups for a week and then move on,” says Li. Jeffrey Fields, Starbucks VP of Design and Content, stated publicly the plain cup is a consumer-generated marketing strategy: the intent of the new design was to create a blank canvas on which people could create their own designs. This controversy will ensure consumers will talk about the new design during a major consumption season — the holidays. Ellen DeGeneres and other giants in the entertainment world have spoken about the red Starbucks cups, generating millions of views on YouTube alone. Li explains this is a marketing technique called “transmedia storytelling.” This marketing strategy tells a single story or experience across multiple platforms and formats. Without paying anyone, Starbucks dominated media outlets the week after the video was released including television, newspapers, radio, and social media. Social media campaigns that have emerged since the red cup release include #itsjustacup from critics of Feuerstein’s video, #MerryChristmasStarbucks from fans of the evangelist, and countless selfies with the cups from users just trying to get in on the action.